Foxes in the henhouse. Pence was elected with Russian assistance and Kobach is an established voter suppressor. Your pick to lead your Commission on Election Integrity has no business investigating voting in this country. Kris Kobach is a longtime lawyer for the Federation for American Immigration Reform – an anti-immigrant extremist group with longstanding ties to white nationalists. He is a leader in the movement to suppress the votes of minorities and has a track record of aggressively finding and prosecuting voter fraud where none exists. The evidence is clear from numerous studies — and we all know — that voter fraud is virtually non-existent in our country. Researchers at the Brennan Center have found that it is rarer than death by lightning. 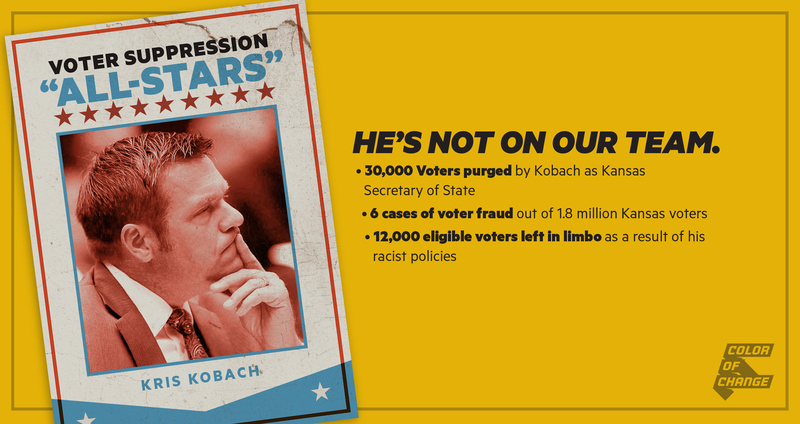 The real threat to our democracy is the kind of voter suppression that Kobach promotes. If the goal of your commission truly is to “identify the laws, rules, policies, activities, strategies and practices that undermine the American people’s confidence in the integrity of the voting process,” you will appoint people to lead it who have a track record of strengthening voting rights and improving voter participation — not those with extremist agendas who want to erode voting rights. If that’s true, you must rescind your appointment of Kobach. He is unfit to serve in this capacity, and his appointment does nothing but telegraph your intention to make this commission as fraudulent as your claims about voter fraud in the November election. Kris Kobach has no business investigating voting in this country. He has ties to anti-immigrant extremists and a track record of voter suppression. Shouldn't the title of this thread be "Pubs work on plans to outright steal ALL elections"? Maryland, Delaware and Louisiana on Monday joined a growing number of U.S. states that have refused to hand over voter data to a commission established by President Donald Trump to investigate possible voting fraud. It takes some effort to top the last Dolt .45 stupidity, but they keep rising to the challenge. Apparently, not one person thought to phone a couple of states before sending out the letter. Trump has blasted the states who have refused to turn over the data. He said in a tweet on Saturday, "What are they trying to hide?" Not original, the same response is all over the web. Dolt .45 is irony clueless. With so many states already resisting, this petition is more likely than most of the ones I post to have a tangible and rapid impact on the holdouts. ... North Carolina’s Bipartisan State Board of Elections and Ethics Enforcement announced Friday that it must cooperate with the request under state law, though it would not provide Social Security numbers, birth dates or driver’s license numbers. “We understand concerns about voters’ privacy. The State Board will provide to the Commission publicly available data as already required under state law,” Kim Westbrook Strach, the board’s executive director, said in a statement. Gov. Roy Cooper, a Democrat, said the state should not participate beyond what is public record. “My staff has told the State Board of Elections that we should not participate in providing sensitive information beyond what is public record as it is unnecessary, and because I have concerns that it is an effort to justify the President's false claims about voter fraud,” Cooper said in a statement. An audit by the Board of Elections found that 508 ineligible voters cast ballots in 2016. More than 4.8 million voters participated in the election. The agency said the incidents weren’t necessarily cases of voter fraud because voters may not have known they were committing a crime. 40 states are now resisting! ... C'mon, it's rare that I find reason to give FL any credit at all. But not FL and SC. I can't remember an instance when 40 states denied a sitting POTUS on anything in my lifetime, or even disagreed with one. Can any of you? We demand that you refuse to provide any and all voting data to the Presidential Advisory Commission on Election Integrity. This commission is on a witch hunt to find rare and virtually non-existent voter fraud in an effort to justify national voting restrictions on Americans. Their request is unprecedented and a blatant attack on our voting rights, and our privacy. Partisan commissions will always be unfair and undemocratic. It's long past time for nonpartisan redistricting. Your obscene gerrymandering has created our state and national mess. So many "safe" seats means we get reps that only serve their team's wingnuts. No special elections in NC this year, but judges order quick drawing of maps to correct unconstitutional gerrymanders. Republican legislative leaders have tapped Thomas Hofeller, a veteran mapmaker for the party, to help with the redrawing of districts. Hofeller was behind the 2011 maps, which are at the root of the court case. My state rep. McGrady took extreme offense when I called the unconstitutional gerrymanders racist, which is merely quoting what the courts have said. He even declared that he'd stop responding to me and urged my state sen. to do the same. McGrady has since started responding again. Sen. Edwards hasn't, but like Apodaca before him he never had, anyhow. The first public meeting of Trump’s voter fraud panel was a horrifying parade of outright lies. Justice, a billionaire businessman with interests in coal and agriculture, won election in November as a Democrat in his first attempt at political office. Until 2015, he had been a registered Republican. So at the start of the 2016 election cycle he magically becomes a Democrat, and uses that to win the election. Waits just a few months, and even with no scandals on the part of the Democrats, becomes a Republican again. THAT is how you outright steal an election.